Stocks are taking a pounding over the last week. We’ve discussed the issues facing stocks many times. In short, China’s economy is slowing, commodity prices are falling, earnings growth is slowing, the Fed is about to raise interest rates for the first time in a decade, and investors are scared that things are about to get a whole lot worse. What’s more, investors aren’t used to market volatility. The S&P 500 hasn’t had a 10% correction in four years… until today. That’s right, the S&P 500 was sitting 7.5% off the all-time closing high on Friday. 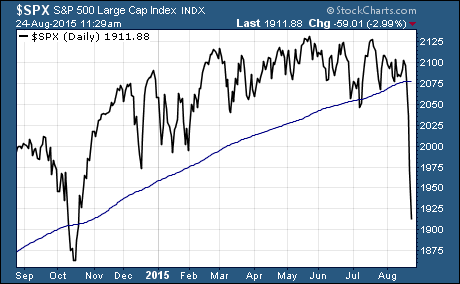 As you can see, the large cap index has broken through support of the 200-day moving average. And it was also 10% below the all-time high. So, here we are… the correction that investors have feared has arrived. Far too many people are simply giving into their fears. They’re choosing to sell their open positions right now… Here’s a better way to manage the correction. Selling stocks or ETFs into a big selloff is the wrong thing to do more often than not. Selling an investment because you are afraid is never the right choice. Don’t get me wrong… there are times to sell. If you have stop losses or other rules in place with your trading plan, then you should follow those rules when they indicate that it’s time to sell. But it shouldn’t be done based on an emotional decision. But the reality is that many long-term buy and hold investors don’t have rules in place for selling. The only time they sell is when they hear or see that their positions are down 10%, 20%, or even more. Pullbacks and correction are a normal part of investing… a stock market that doesn’t have a 10% correction in more than 1,000 days isn’t normal. And things could get a lot worse before they get better. It’s pretty common to see corrections that shave 20% to 30% off of the S&P 500 every few years. And the really big corrections can cut the value of S&P 500 in half. There’s no doubt about it, holding through massive draw-downs in stocks is never easy. But keep one thing in mind… the S&P 500 has always bounced back to make a higher high than before. Let’s call it as it is… most investors are horrible market timers. If you sell your long US stock ETFs right now and they go right back up, you’ve cost yourself years worth of profits. And can compound the problem if the ETF you sold isn’t in a tax sheltered account like an IRA. Sell in a panic. You pay capital gains on the position. And then you buy back into it or a similar ETF at a higher price than what you sold it at in a panic. Buying high and selling low isn’t the way to make money investing in stocks. Instead of selling your open stock ETF positions, you can hedge them with an inverse ETF. Inverse ETFs are designed to move in the opposite direction as the index it tracks. If you are invested in an ETF like SPDR S&P 500 $SPY, you can hedge your investment by buying an equal dollar amount of an inverse ETF. One ETF that provides inverse exposure to the S&P 500 is the ProShares Short S&P 500 $SH. Owning an equal position of SPY and SH essentially cancels any gains or losses in the other ETF. This is the same as selling but you don’t have to expose yourself to capital gains taxes. After things calm down and you are able to make a decision free of emotion, then you make a more permanent decision. You can decide to close both positions and wipe out all exposure to the investment. Or you close one half of the position to leave yourself with a long or short position. Don’t make an emotional sell decision. Buy yourself time by hedging your open ETF positions with inverse ETFs and avoid compounding the problem with tax consequences.